Madison Deluxe models feature our Contour tube-style burner, designed to complement the hand-painted ceramic fiber log set, and produce a natural dancing flame. Madison Deluxe models have louvers and available trim kits. 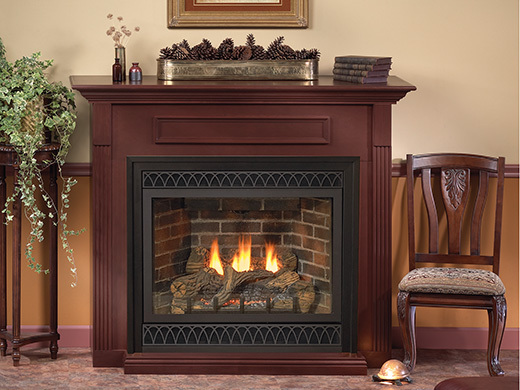 The large heat-resistant, tempered glass window provides an unobstructed view to the log set. Tahoe Deluxe offer several styles of liners – Aged Brick, Herringbone, Stacked Limestone, and Black Reflective. Madison Deluxe models require just 16 inches of depth making them ideal for applications where wall-cavity space is tight.